China has become the third larger exporter of arms in the world, even though it is still far behind the U.S. and Russia. It has moved from selling lower-end weapons to advanced ones, as its R&D capabilities improved. China stresses its competitiveness in terms of prices and services, but recognised the lack of experience in real-life battles. Interestingly, China also tries to promote and justify a kind of “Chinese exceptionalism” in selling weapons, as China’s sales would promote regional stability whilst American ones would foster instability. This may only increase the American feeling of threat in terms of their global relative power status. China is now a new competitor that counts also in arms’ deals and will only see its weight rising with time. Furthermore, as the arms’ deals are likely to be increasingly made and paid in Yuan and/or partner’s currency, this will directly impact the supremacy of the USD. Finally, as China will most probably mix its One Belt One Road (OBOR) strategy with weapons exports, American influence may dwindle or to the least be strongly counter-balanced on the short to mid-term on the New Silk Road segments, with impacts for American businesses. The impact on the strategic presence of America in Asia is more uncertain as Asian countries, on the one hand, may want to balance China and the U.S., but, on the other, may be warry of an aggressive American presence in the area, hence, most probably, China’s emphasis on the contrast between China as bringing stabilisation versus the US as fostering instability. As a result of future possible protracted tensions between the U.S. and China, instability could develop in East Asia. China has become a larger player in the global arms industry in recent years and exports have been shifting from low-end weapons to increasingly advanced ones, though the country applies strict rules to arms exports. 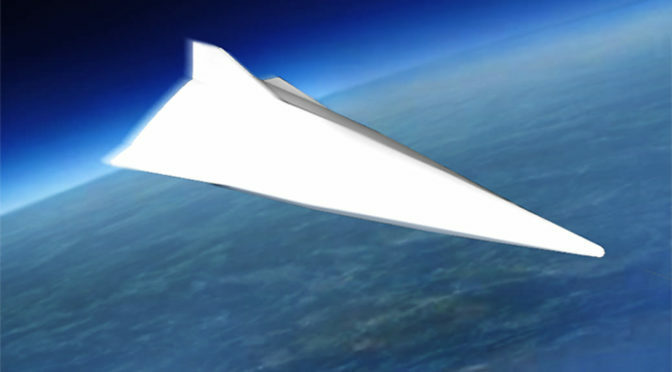 Featured image: One of the Chinese hypersonic gliding vehicle projects. Its configuration was first exposed by Military Report on CCTV-7 by 果壳军事 (Own work) [CC BY-SA 4.0 (https://creativecommons.org/licenses/by-sa/4.0)], via Wikimedia Commons.